They call upon NICE, the GMC and the pharmaceutical industry to address the problem, and they also take a very strong clear position: that withholding the results of clinical trials should be neither legal nor ethical. Do please sign up to the alltrials.net campaign, calling for publication of all Clinical Study Reports, for all trials, on all treatments currently in use. And also consider responding to the House of Commons Science and Technology Select Committee report on withheld trial results, closing next month. The MPs also express concern about the implications for the effectiveness of NICE of recent evidence about access to information from clinical drug trials. They argue that there should be both a professional and legal obligation to ensure that all regulators, including NICE, have access to all available research data about the efficacy and safety of pharmaceutical products which are in use in the UK. All information arising from drug trials concerning drugs that are in clinical use should be in the public domain in an accessible form. The Committee urges the pharmaceutical industry to introduce a new code of practice to make this commitment effective and calls on the GMC to reiterate its guidance to doctors on the conduct of drug trials. The Committee argues that it should be neither legal nor ethical to withhold research data about pharmaceutical products which are in clinical use. It is concerned that the fact that this simple principle is not universally applied in practice undermines the effectiveness of NICE; the Committee welcomes the current review of these issues by the House of Commons Science and Technology Committee and recommends that that Committee should examine the nature of both the legal and ethical principles which should cover these issues and how to make those principles enforceable in practice. The Health Select Committee’s recommendation is unnecessarily and unfortunately restricted to drug trials. They should have said “clinical trials” because this would include studies on medical devices, diagnostic and therapeutic procedures, and diagnostic tests. The wording of the campaign at alltrials.net is “clinical trials”, and we are clear that we need all results about all trials on all treatments currently in use, not just drugs. 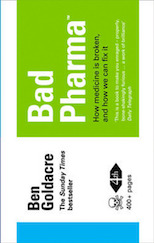 We are also clear (as is the book Bad Pharma) that this is not just a problem of industry. It’s important that this is widely recognised. It’s all very well tightening the regulations and insisting on complete transparency on clinical trials – and from a scientific viewpoint makes total sense. Acting in isolation does have it’s dangers though. How do we prevent these trials being undertaken in countries with a less stringent regulatory framework ? Although the current situation isn’t ideal, at least this research is being carried out on our doorstep and we have a greater chance of calling out trial sponsors if we suspect results are being hidden or fudged. If we tighten things up too much in this country aren’t we in danger of shifting these trials to third world countries where we have no influence on the conduct of these trials ? I’m not trying to be an apologist for the companies involved – I just think there are inherent dangers in acting in unilateral action. Oops – that last sentence came out a bit mangled thanks to my iPhone scrolling – my apologies.